Oklahoma City is chockablock with parks, with green spaces scattered throughout nearly every neighborhood. While most of these parks have some sort of multi-use perimeter trail, some are longer and more appealing to runners than others. Here are some of the favorite parks for running in Oklahoma City. See also Mitch Park in Edmond. Bluff Creek Park: Trail runners and pavement pounders alike will enjoy these trails north of Lake Hefner. There are two 1-mile paved loops, one on the east side and one on the west side of the park. In addition to these, runners can enjoy over 3 miles of rolling singletrack along scenic Bluff Creek. Combine with the Lake Hefner trails for more mileage. Dolese Youth Park: Located in Warr Acres in the northwest of OKC, the paved 2 mile nature trail at Dolese Park includes markers every ¼ mile, so you can track your pace perfectly! MAP. Earlywine Park: Multi-use paths are great, but if you seek a running space you don’t have to share with cyclists, head to the bike-free trails of Earlywine Park in the south of the city. The paved loop here is about 1.5 miles, and well-lit. MAP. Eldon Lyon Park: A northwest park in Bethany, Eldon Lyon includes a 1.5 mile loop with some rolling elevation and one fairly steep hill. MAP. Joe Barnes Regional Park: This park in the midwest part of the city has about 3 miles of paved paths along Soldier Creek that stay lit into the evening. Combined with Poore Park, runners can put together an out and back of about 5 miles. MAP. Martin Nature Park: Martin Nature Park is a pleasant 2.5 mile loop with plenty of opportunities to spot wildlife just to the north of the city. MAP. 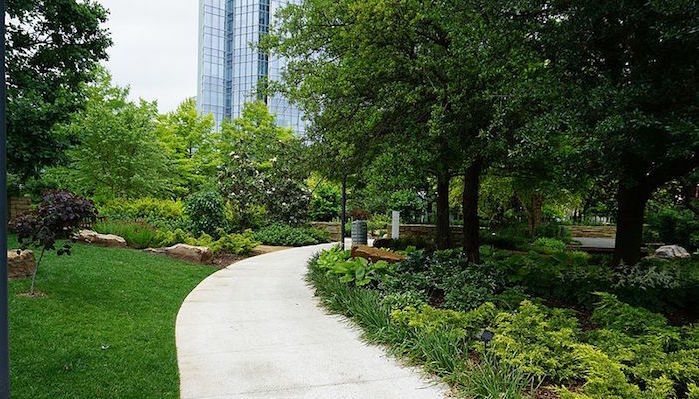 Myriad Botanical Gardens: These 17 acre gardens in downtown Oklahoma City are a wonderful place to stroll and run without leaving the bustle of the tourism and business center. Admission to the outdoor gardens is free (optional entrance to the Tropical Conservancy is $8 for adults). A loop around the park is about 1 mile, but a great add-on is the nearby Bricktown route. MAP. GARDENS INFO.